A Tamil Movie After 13 Years. My mother tongue is Tamil and given the choice, I love to use that in my conversations and always do so with all members of my family, but alas, only on the telephone as I live in Maharashtra where we speak Marathi, Hindi and English in that order, Since I have lived most of my adult life outside Tamil Nadu, I lost touch with Tamil movies except to see those in which my sister Padmini came on in cameo roles. The last Tamil film that I saw was in 2002 called Kannathhil Muththamittal when I was based in Tamil Nadu on a short assignment. That was a very memorable outing about which I will blog another time but after that, I was able to see an amazing Tamil movie today. It was by accident that I came to know that some local theaters screen Tamil films and since this particular film Papanaasam has received rave reviews and wide publicity, I decided to go to it despite knowing that it would take over three and a half hours of sitting inside a theater watching ads, trailers and the feature film. I have recently been seeing some Hindi films which I have even reviewed here in my blog posts and have been quite impressed with the quality of the films coming out of Bollywood. 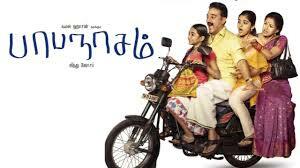 and this film has impressed me that even Kollywood has now come of age. The link to the film gives you a full insight about the film and all that I want to share with you is my amazement that such a remarkable film has been made at all anywhere in India. This is comparable to the best of any commercial film made anywhere in the world. For me it was like revisiting some parts of Tamil Nadu with which I am quite familiar and I was so nostalgic listening to the local dialect in the dialogues. The locations were also reminiscent of my days of slogging in rural Tamil Nadu and since I did not need to read the subtitles, found them to be a bit of a distraction. Since I reached the theater a bit early, I was also able to make friends with some young IAF airmen from the local air base, who were delighted to have a local Senior Citizen Tamil to share their joy with them and I too enjoyed their brief association. The story is unusual and the actors, director and editors have all come together with some remarkable music in the background, quite appropriate and unobtrusive, to produce a very enjoyable experience. Since the version I saw had English subtitles, I suppose that for most of my readers, that option will be available and I recommend this film to them with a full [rating=6] rating. This entry was posted in Language, Movies, Music, Nostalgia, People and tagged Kannathil Muthamittal IAF, Papanaasam. Bookmark the permalink. 5 Responses to A Tamil Movie After 13 Years. Once again, I’m so happy for you. I can see why that would be such a profound experience. I am now promoting it among all my friends here with evangelical zeal! If you do come across one that does show this one, do try and see it. This a remake of a Malayalam movie called Drishyam. There is also a Hindi version coming out this month starring Ajay Devgn. A very fine movie. I had seen the Malayalam version when it came out and really looking forward to see how the Tamil version holds.